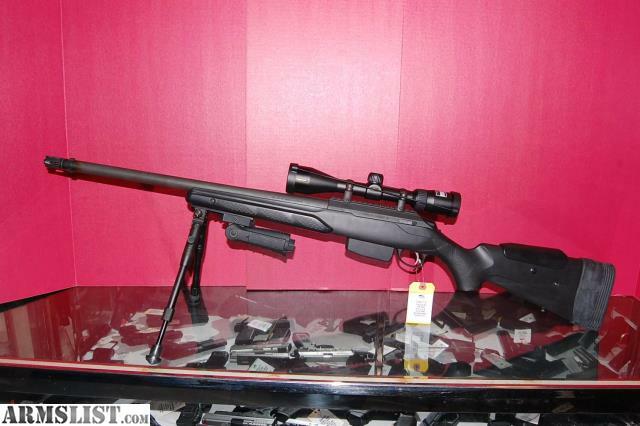 Sleek, rugged, lightweight and highly accurate, Tikka's T3X Tactical Rifle Available in .308 Win. featuring a 10-round steel magazine. This multipurpose rifle is easy to carry when pursuing game over rough terrain. A silky-smooth two-lug bolt action with push feed and plunger ejector, teams with a crisp, single-stage adjustable trigger from 2 to 4 lbs. Matte-black synthetic stock with adjustable cheekpiece is impervious to all weather conditions. Soft rubber recoil pad absorbs mild shock produced during recoil. Nikon ProStaff 3-9 Lomg range hunter scope mounted on Picatinny rail. Bi-pod and fore grip installed. Used low round count excellent condition.